Every month we feature behind-the-scenes interviews with the individuals who, together, make CPW Dentistry the special place that it is. 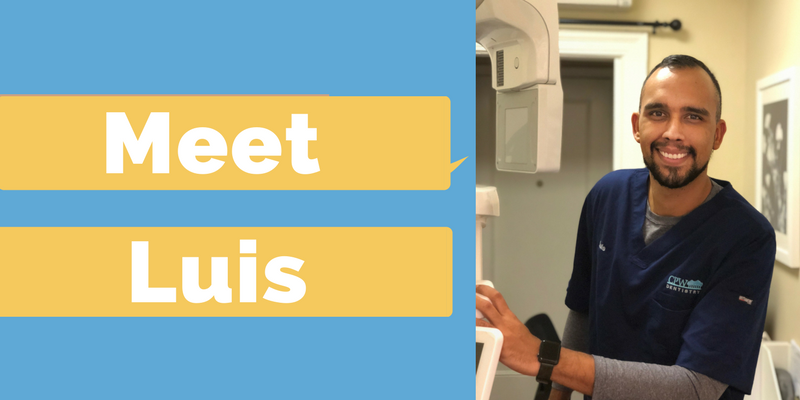 This month, we’re featuring Luis. My main role at CPW Dentistry is Clinical Assistant. I mainly work with the specialists (our Periodontists and Endodontist) but also assist the General Dentists. When I’m assisting the doctors a typical day for me begins with a huddle with the team who is working that day, review our schedule and procedures and come up with ways to stay on time, make the most of every visit, and ensure people have a really positive experience. In addition to working with the doctors, I have extra roles within the practice, a lot of which aren’t as clinical. I help train the new doctors, recruit and onboard new team members, work with the scheduling team to help people schedule treatment appointments, and make sure that we’re compliant with health and safety regulations. What I like the most about working CPW Dentistry is our team culture. Every time I come to work I feel like I’m seeing family and friends and that makes it not feel like work at all! Also, I enjoy being able to deliver top-notch dental service and wow our patients with a level of care that is not usually expected from a typical dental office. I’m passionate about being part of changing peoples lives to some degree. As a clinical assistant working with doctors, I get to experience first hand how we can change someone’s entire life just by choosing the right dental treatment! It can also happen in more subtle ways when we can simply influence someone to make habit changes in their oral health that have a real impact. Witnessing the positive outcomes not only in the cosmetics but their everyday life, feels incredible. I’m also very passionate about traveling, musical theater and food! Don’t take life too seriously, we only get this one chance! Laugh, eat and go see the world.